Which kayak rack you choose for your truck very much depends on not just your kayak but what else you need to get on your truck! Ok, you did you homework and got the right kayak, now you need to make another decision on how to transport your new kayak. Some kayaks are heavy and cumbersome especially fishing kayaks; you need to put some thought into what will be the best system for you, your kayak and your truck, SUV or car. We see over and over that people come here but have already purchased an expensive rack system and in some cases could have got away with their existing set up or a much cheaper system. 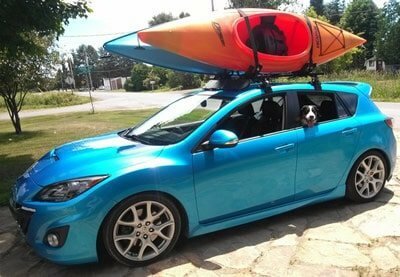 It’s a good idea to figure out what kayak(s) and what other equipment you would like to carry on your vehicle so you can make a better choice of what accessories and bar length you will need. Different vehicles will create different considerations to contend with, like the height of your vehicle could make a certain carrying system harder to make work or having a shorter roof (economy sized cars or compact trucks) might make hulling a 16′ kayak very difficult. 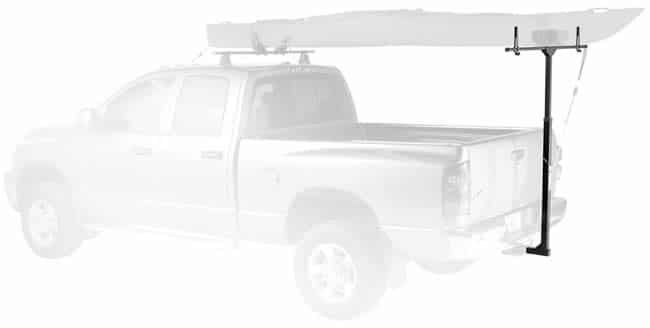 Well below are some of the best truck kayak racks available, and we have tried to include the best of each type as well as different price points. 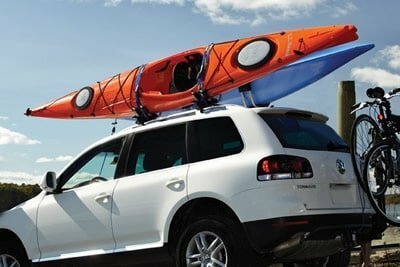 From horizontal racks where the kayak lays flat on the roof of your truck, SUV or car, to vertical kayak racks where you can stack your kayaks up on their side. 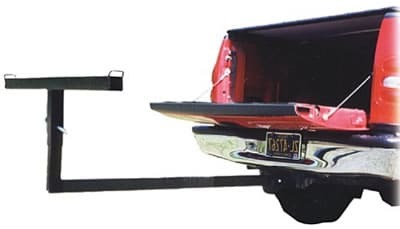 J-style racks or J-cradles as they are often called, which fold down when you don’t need them and lastly hitch mount kayak racks which have a load bar that is mounted on the rear of the truck with a hitch receiver keeping it from moving. Lots of choice depending on what other equipment you want to load up. Click the ‘More Details’ buttons above for detailed specifications for each product, or read on for cheaper hacks to use what you already have on your Truck, SUV or car. Let’s go over some of the choices for securing your kayak and then lets take a look at some of the accessories and techniques to help get your kayak on your vehicle. Depending on your vehicles you might have to get a rack system, by rack system I mean the bars and feet that attach to your vehicle, these bars will enable you to use some of the other carrier accessories to transport your kayak. The most widely used systems are by Thule and Yakima. We like the Sportrack racks because they are 30% cheaper than the aforementioned companies and come assembled and ready to go right out of the box. Of course your vehicle might come with factory bars (usually oblong shaped) and these can work fine with most kayak carriers and do the job but if you need to carry more accessories or multiple kayaks an after market racks system might be your best option. Our choice is Malone Carriers which work on Thule, Yakima and factory bars. Their center mounting bracket allows you to maximize space on your bar. This method can either just be placed on the roof of the car or on your factory or aftermarket rack bars. A very economical transport system, the blocks and some tie-down straps provide all you need to get your kayak to and from the water. A very popular method for cars without factory racks or rails. Foam blocks can used for with SUV’s factory bar systems and are made to fit Thule and Yakima. The price is right, the blocks and some tie-down straps for can be had for about $40. The blocks are very easy to get one and off so when they’re not needed you don’t have to have them on your car. If using the blocks on a car, getting the blocks to stay put as you get the kayak on the can be challenging especially in windy conditions. These pads were originally designed for surfboards but work well for kayaks, the pads just wrap around your existing bars and there is usually Velcro to hold them in place. A very good choice if you transport you kayak face down, by carrying face down you are placing the load on the strongest part of the kayak and it is the way many kayak companies recommend to carry them so as to insure not damaging the hull. 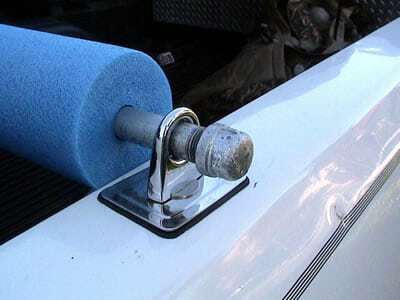 Like foam blocks, it can be very an economical set up, especially if you already have bars on your vehicle. They also, unlike foam blocks won’t fly off the vehicle. Pads usually don’t have a lot of cushion and can dent some kayaks if transported with the hull down or if you over tighten the tie-down straps. Cradles and saddles are a very popular way to carry a kayak and a lot of companies make many different variations. Designed to carry the kayak right side up (just like it is on the water), these attachments simply fix to your roof rack or bars and usually come with straps and hooks to secure the front and rear of your kayak to your truck, SUV or car. Personally we like this setup as it reduces drag when driving and you can easily have a bike on your rack as well, so you have plenty of options. The only downside is this system can limit the amount of kayaks you can carry, but there are a few work arounds! These tend to keep kayak in place and protect the hull from damage. 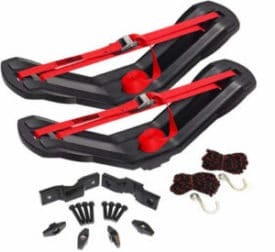 These systems usually work well with other pieces of equipment that aid in getting your kayak on your kayak like rollers and glide pads (we will discuss these later). These set-ups are designed to transport your kayak face up and some people choose to transport face down. Also, if you are going to transport 2 kayaks cradles do limit the usable space on your rack bars, one exception is cradles with just one center fastening device like the Malone Gul-Wings. Designed for large kayaks, the SeaWing is a mid-point holding, single kayak carrier that is quick to setup and provides additional space on your roof compared to the standard bottom down carriers. The saddle is just one piece per bar as opposed to a pair for front and back it allows you to move the saddle over to one side and of rack and maximize the roof rack space. These work by carrying your kayak(s) on their side in J-shaped racks. Great if you are looking to transport multiple kayaks or canoes and quite cheap compared to other methods. Another thing we like about J carriers is that they fit virtually any roof rack or bars, so there is a lot of choice on the market which has pushed the price down considerably. But as always, if you buy the cheapest, you get what you pay for, so take a look at a few of our recommendations to find the right balance between price and quality. J-carriers work well to protect the kayak hull from damage when tightening the straps. They will also maximize your roof space to allow for extra kayaks or other accessories. It can be tough to maneuver the kayak on top of your vehicle and into the side position of the J-carrier, especially if your vehicle is tall. Also, be careful in the your mall parking garage as the added height could be a problem. The type of vehicle you drive, in most cases can dictate the kayak transport system that you will work best for you. Nothing is easier than tossing the kayak on the bed and going. If the kayak is hanging far over the end you must hang a flag on it for safety, some companies make bed extenders to help carry the kayak with a pickup truck. The extenders plug into the hitch mount and can give you bed up to 4′ of extension. 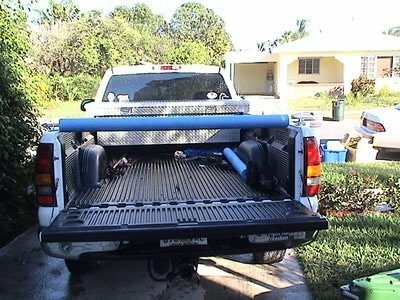 Another option is to use the cab of the pickup and some form of a frame to elevate the kayak, sometimes mounted in the hitch – these work well and now you have the bed space open. Jeeps are very similar to an SUV and a truck in that the Jeep kayak rack solution you will use will use both roof bars (hardtop and soft top) and most likely an extender to the rear hitch mount. The best Jeep kayak rack solution in our opinion is the Bestop HighRock 4×4 Overhead Rack for Jeep Wranglers as it is extremely easy to fit with no drilling required. This is a great option for smaller kayaks and if you need something to fit a larger fishing kayak, just use the rear hitch mount from Thule and you should be good to go. Another option is the Smittybuilt SRC roof rack which gives you a great base to fit most kayaks and also a whole range of attachments carry pretty much anything! I was able to transport my kayak on very long trips with just a couple foam blocks and tie-down straps. Cars with short roofs can be a challenge, especially 2-door cars, the shorter the distance between the straps the less secure the system will be, always, use some rope or another strap to fasten front and back to insure a secure system. A favorite of ours is the Rope Wrangler; this little device makes tying front and back to your vehicle a snap. Another options is putting a rack system on the car – this will make life easier, protect the roof of your car and allow you more room for other sports gear. Rack manufacturers make special rack system for 2 door cars with shorter roofs. Thule and Yakima make good system for cars, we have been using SportRack, they make a system that can fit most cars and only costs $119 and includes locks (locks are extra in both Thule and Yakima). The longer roof frame does give you some advantages over cars, but sometime the added height of an SUV can make getting your kayak on top a little harder. 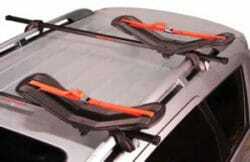 Most SUV’s come with factory racks that work well to receive most kayak carriers and transport accessories. 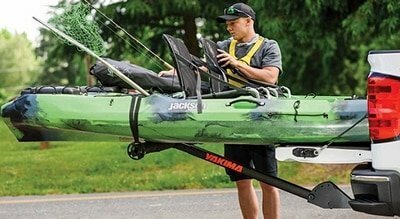 Factory racks systems do have weight limits but most can handle 2 kayaks without a problem, a popular way to transport two kayaks with a factory system is to transport one in a J-type carrier and the other flat or to really maximize space using 2 J-Carriers. Going with after market bars will give you some added room (length). Before you choose the length of bar make sure you figure out the requirements of your equipment. According to the law – you can only go as wide as your side-view mirrors. This is fast becoming a popular alternative, no matter how many kayaks you want to transport, companies are making trailers designed for kayaks and in some cases can be close to cost of a rack system. We recommend Trailex Trailers, they make a single kayak version that is light enough to unhook and use as a dolly to get right up to the water. For those who want to carry more than one kayak they make multi-kayak trailers. No matter what system you are using you will still have to get the kayak onto that setup, you will find, like anything else you will get better and learn how to finesse the kayak rather than muscling it. Some products are making this easier – lets discuss them. Thule Hydro Glide: This works when loading your kayak from one end of your vehicle and also acts to hold the kayak during transport. The kayak slips on pads that are felt covered. Yakima Hully Rollers: Like the Hydro Glides, the rollers aid with loading and holding the kayak in place in transport. Some people have had problems with the rollers damaging the kayak with over-tightening while strapping the kayak down, so care should be taken when using them. Loading Bars: Thule as well other companies make a bar that extends out so you can lift one end of the kayak on the bar and then lift the other side onto your rack. 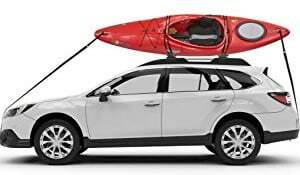 Lift Assist Accessories: Companies now make accessories to help you get your kayak unto your roof. One such product is the Hullavator by Thule, the kayak is loaded at waist height and then there is assist in the device to get it up to the top of the vehicle. In my opinion these do make it easier but are not magic, it still takes a lot of work to get the kayak on the system and then muscle it up. Roller Loader: This little device works great to help you get your kayak up on your vehicle. It basically is a dolly that suctions on to the vehicle and you just roll the kayak on or off. 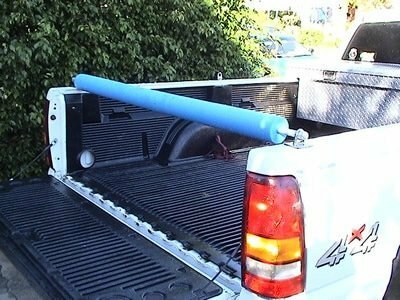 A very low-tech option that works particularly well with mini-vans, SUV’s and station wagons is just to place a bathroom mat (with rubber backing – so it wont slide) on the rear of the vehicle and place one end of the kayak on the mat and just slide onto the rack. Here is a video clip of me using a bathroom mat to load a kayak on a vehicle. Always give the kayak a few good tugs before driving away to make sure you are secure. If using straps with auto-lock buckles, always put a half hitch in the strapping after tying down to insure that even if the buckle loosens the strap will not come lose. If using ratchet style tie it can be very easy to over-tighten and do damage to the kayak. So make sure that the kayak snug but don’t go overboard. When transporting in a flat bed pickup, dont choose places on the kayak to fasten to that can fail, like the handles. 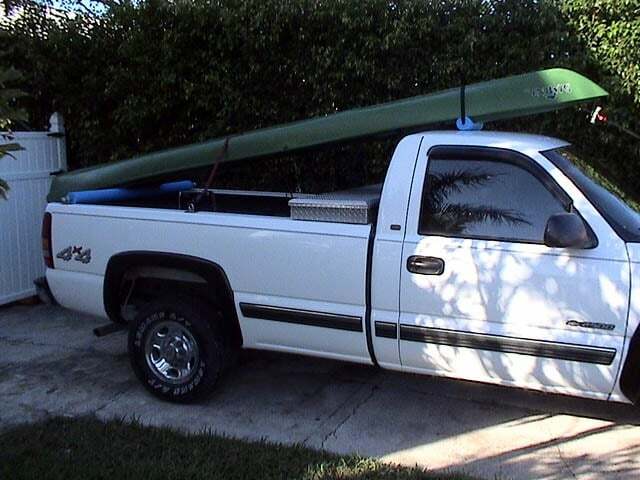 We recommend passing the straps through the scupper holes of the kayak and tying that off in the bed of the truck. With gas prices going through the roof it might be of interest that a kayak transported face down will give you more aerodynamics and better gas mileage than a kayak transported face up. Some cars roof areas can compress when using foam block, these usually pop back out, the strongest part of the roof will be closer to the front and rear windows and this is where you should try to get your blocks. Also, if you find that after you tighten down that the kayak (while using foam block) is making contact with the car in the area between the blocks then placing a piece of rug or mat there is a good idea and will protect the car from scratching. Step 1) Get the KaNoodles and anchor points at Wal Mart. Step 2) Attach anchor points securely to truck. Assuming you got the correct ones (see pics), the 3/4″ pipe will fit neatly inside them. Step 3) Measure distance between the anchor point centers. Add an inch and secure the pipe and end fittings from Home Depot. Step 4) Slide pipe inside KaNoodle. Step 5) Attach KaNoodle / pipe assembly to anchor points with end caps. The entire setup should spin freely within the anchor points. Step 6) Cut the other KaNoodle to fit the bow of your yak, leave the ends intact to put a tie down strap through. You’re Done! Placing the bow of your boat on the Rolling KaNoodle will make it easy to strap-on, tie down and go! Use of bungees / straps bow and stern are recommended – hook on bumpers and carrying handles respectively. The most important point to secure is the bow – don’t let it catch the wind while you travel whether you use the KaNoodle roller or not. Using a cam-buckle or ratcheting-type strap amidships, tighten the load gently but securely.